http://amazingribs.com/ * - awesome resource. Thread was started by request. Quick shout out: I was interested in proper 'BBQ' for a while, but Mortymoose's thread really inspired me to start smoking my favourite stuff regularly. I don't know about other areas, but nothing in Durban is done in a proper Southern-US BBQ style. 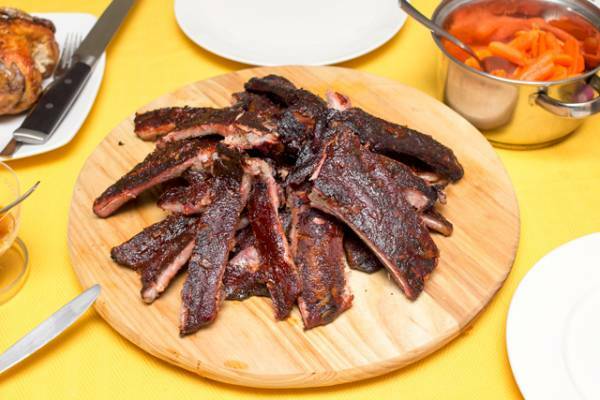 All ribs here are either slow roasted in ovens, cold smoked then finished on a grill, or boiled then stuck under a broiler to finish them off before serving. The stuff I make with an initial, relatively low expense is far superior to anything I've tasted in restaurants here. Try it at home, you'll be amazed. Will be doing ribs again this Sunday. Your ribs look great! I tried chicken once, but didn't get it right. I've done pork shoulder multiple times (love it!) and brisket once. Brisket is very good, I must actually do it more often. EDIT: I've done pork ribs a few times - my only problem is that they tend to dry out after a few hours. So they are less juicy than restaurant ribs. Still good though. Very different flavour to what you normally get in restaurants. But pork shoulder is still the best for me, that stuff is simply amazing. Sorry for going a bit off topic but have you tried the giant beef ribs from Woolworths? I am keen on trying to do something similar by smoking them and then finishing them in my pizza oven but need some ideas. don't want to rain on the parade but isn't that stuff carcinogenic? P.S. i'm keen to do pulled pork. brisket too, but not smoked. Was hoping you'd post here, I've got no experience with the larger cuts yet, only the relatively shorter cooks - ribs are done in around 6 hours, chicken in around 90 mins, wings in an hour or so. 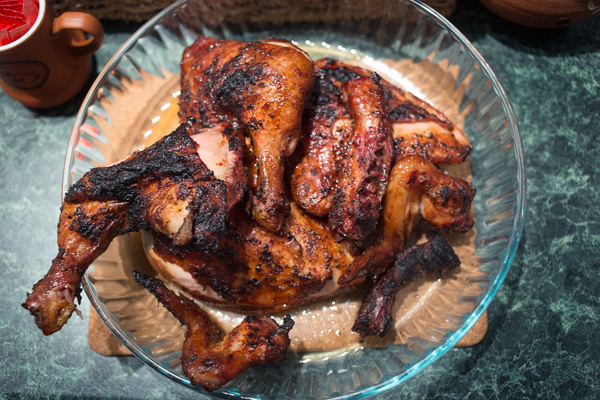 Chicken tip: You need higher heat for the skin to get crispy while the meat stays moist. I do mine at +- 300F or a bit higher. Ribs: I use the 3-2-1 method, 3 hours with rub, 2 hours in foil, 1 hour out of foil. Always juicy. I'm having a difficult time finding the cuts I see online from the US regarding brisket. Care to share your techniques for the longer cooks, ie the brisket and shoulders? Do you use the minion and/or snake method for those? I've done something similar with short rib. But with those I cooked them sous-vide for around 24 hours then finished them off on the smoker for around 2 hours. I'm not sure what's going on there? They say low and slow cooked and smoked, but the package states uncooked? 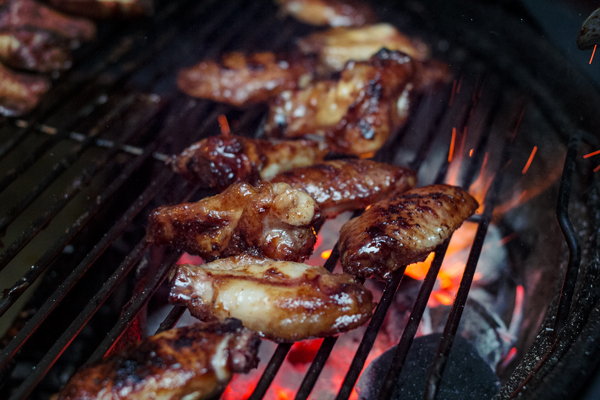 Everything is carcinogenic Creosote buildups can be harmful, but you negate that by making sure you don't cook at too high temps and making sure your tools are cleaned properly and often, and that you have a proper exhaust vents for your smoke. They are most certainly cooked I just finish them for a few minutes a side on a hot fire and they are done. Nice strong smoke flavor I quite enjoy them but hardly ever buy them. I was thinking of putting some ribs in a casserole with a grid and oak chips in the bottom and then sticking that in the pizza oven. 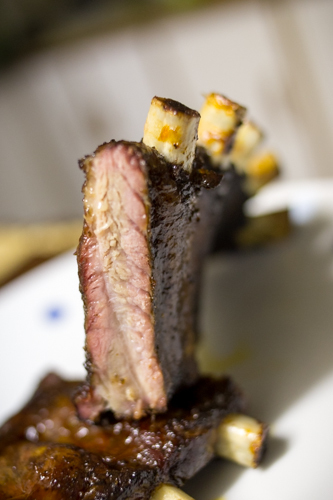 Those awesome looking ribs - did you cook them from raw and did you do anything to them pre smoking? What type of ribs - hard to find in the shops these long full rack ribs - again I suppose a good free range butchery should be able to advise but those look quite tastey. Creosote buildups can be harmful, but you negate that by making sure you don't cook at too high temps and making sure your tools are cleaned properly and often, and that you have a proper exhaust vents for your smoke. Ah OK. Wonder why it says 'uncooked'. How much control do you have over the temperature of the pizza oven? I always thought they ran quite hot. Cooked from completely raw. I cleaned them and removed the membrane from the back of the ribs, trimmed where I needed to. Salted the ribs, let it sit for a bit then applied a rub (Memphis Meat Dust, found in the amazingribs link above). That sat overnight. That's it. The ribs I buy are spare ribs, you can use baby back ribs which sit higher up on the pig but they require slightly different cooking times. Pop into your local butchery, they should have it. I source mine from a farm in the Midlands now though, as even the ribs from my butchery (as opposed to the supermarket) are cut so close to the bone there's hardly any meat. Its not too bad you keep the fire going for 1:30+ and size the fire according to the temperature you want, once all the bricks are at temperature they take a good few hours to start cooling down if you close the doorway I have done that for bread and a chicken before. For pizza you make it as hot as possible and keep a fire going the whole time your making pizza. Some people make pizza on the saturday let the oven cool a bit then stick a chicken or roast in the oven close the door and leave it overnight for sunday lunch. Its actually pretty versatile. Smoking thread? I came here thinking it's a place where we smokers could hang out without being hounded by puritans. Turns out this is a thread for smoking meat, not meeting smoke. I use the minion method, not the snake method. I won't say that my results are perfect - I don't think the Weber was really designed to smoke food for 14 hours at a time, so temperature control is tricky sometimes. Especially on windy days. Remind me to upload photos! What I do is that I divide the weber using a charcoal rail into one volume that is two thirds the area of the kettle, and another volume that is one third the area of the kettle. I also use tinfoil folded double as a heat barrier. I fold a large piece of tinfoil in half, then fold the bottom section so that it will stand up. I put that new tab in the charcoal area. Be careful not to make the tab too large, otherwise you will block air from reaching your fuel. This barrier prevents too much heat radiating from the fire into the food. Into the smaller area, I put a mixture of briquettes and smoking chips. I use different wood depending on the meat. You can also use regular hardwood from Checkers instead of special wood chips, again it depends on what you want to do. I do one layer of briquettes, and then put wood chips on top of that. This is because the small wood chips usually fall straight though otherwise. Then another layer of briquettes and sometimes more wood chips. I always leave the space at the right hand side of the charcoal area free of wood and briquettes. That is where the firelighters go. Before lighting the fire, pour some water into a tinfoil roasting pan and put that roasting pan in the larger section of the weber. Now, you can light the fire. Keep all of the vents open and the lid off. After 15 minutes or so, dump some wood chips on the fire and you can now start your cook. When you put the lid on, make sure that the vent on the top is on the opposite to the fire. Make sure that vent is fully open. Also, make sure that the vents at the bottom are nearly closed. There should be a small gap for air. This is how you control the temperature of the fire. Every so often, maybe every 2 hours or so, you need to hit the side of your weber because ashes will clog the vents otherwise. I'm sure I could get better quality meat at a speciality butcher, but at the moment, I get my meat from the large Pick n Pay on William Nicol, or the Food Lovers Market on William Nicol. I've only ever done brisket once, I did get that from a butchery. I have more experience with pork shoulder. Make sure you remove the skin (crackling) and most of the fat cap from the shoulder. If you want to make crackling, don't try to do it in a smoker, it doesnt work. Trust me, I've tried. 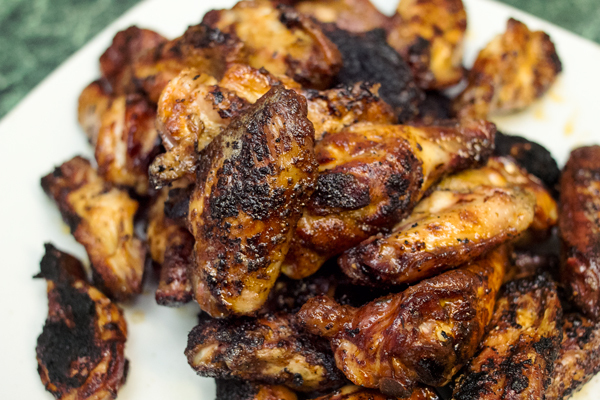 I don't think it makes a massive difference whether you put your rub on the night before or just before cooking - I've done both and never noticed much difference. I don't baste or mop and all of mine have been very juicy. The largest pork shoulder I have ever done was 4kgs, and I think I put it on at about 5 in the morning. It came off at 6 or so that evening, and we could pull it apart. What I'm going to try do in future is maybe be more careful with the amount of wood chips I use on long cooks like that - it can make the meat bitter tasting. Oh I've also smoked lamb rib once or twice. I think that needs higher heat though. My thoughts exactly. Thread should be renamed to "The Smoking Meat Thread". What's the weight of those wood chips from TakeAlot in the OP? Checkers also sells Weber wood chips, which are quite good. Something like R80 for a bag, but it goes a long way. And you get different wood types - Mesquite, Hickory etc. You can also do smoking with regular hardwood.